Raghunatha Dasa Goswami (1495–1571) was the only son of a wealthy landowner. 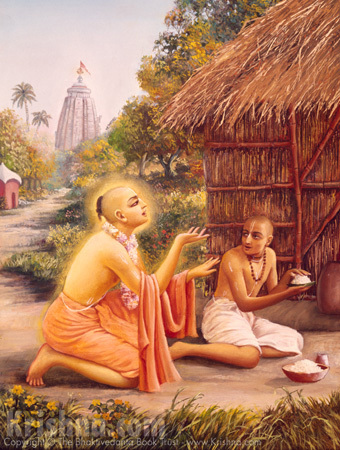 At the age of fifteen, however, he met Chaitanya Mahaprabhu and later became one of the six Goswamis of Vrindavan who were Mahaprabhu's direct followers. Raghunatha Dasa led a most austere life of pure devotion. He was the very emblem of renunciation. He wrote the three books Stavavali, Muktacharita, and Dana-charita. He was known as the prayojana acharya, he who by example teaches life's ultimate goal. His samadhi stands on the bank of Radha-kunda, Vrindavan, India.